Pakistan's Interior Minister Chaudhry Nisar Ali Khan continues to keep everyone guessing about his futiure in politics. In the latest development, according to the Express Tribune, Khan has written to his Interior Secretary and told him that his stint as a minister in charge of the department was the brightest and the most challenging period of his over three-decade-long political career. He has described his present tenure as Interior Minister as the most challenging in terms of the huge and multi-faceted challenges the country was facing. The Express Tribune quotes the letter, as saying, "From the issues connected to our national security, the fight against militants to ensuring internal security and maintenance of law and order, from various administrative measures and internal reforms within our organisation to formulating new policies aimed at restoring sanctity of our laws and introducing transparency and rule of law, we had multi-dimensional tasks before us." Lauding his colleagues and bureaucrats, he further states, "Whatever we have been able to accomplish during this period is a matter of record. I give credit to the entire team of the ministry and its attached departments who have worked with me diligently and provided me the support in translating our vision into reality." He expressed the hope that the momentum generated during his tenure would be carried forward and each day would witness further improvement in the ability of the ministry and its attached departments towards service delivery. 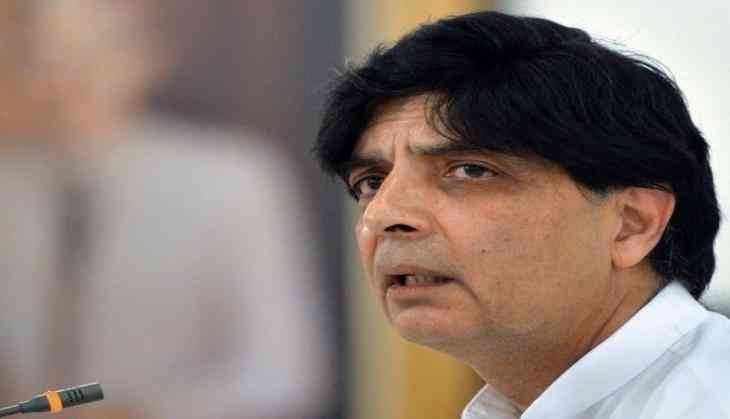 It maybe recalled that on 27 July , Nisar Ali Khan had announced that he would quit politics, resign from National Assembly seat and step aside as interior minister moments after the apex court announces its verdict in the Panama Papers case. Addressing a press conference here then, Nisar said he would resign from his ministry and National Assembly seat regardless of apex court's verdict. However, later the Ministry of Interior issued a clarification on behalf of Khan that he had changed his mind after consultations with some friends. Khan has advised former Prime Minister Nawaz Sharif to keep his feet on the ground no mattter what the Panama Papers Leak case verdict is. He said: "Do not react harshly to your political rivals if the decision is in your favour. Adopt the policy of 'forgive and forget' in case of an adverse verdict. You need to ensure unity within the PML-N and you need to take it forward."